Anyone reading the international news these days knows about the turmoil currently engulfing a number of nations in the Middle East. In fact, for the past decade, it’s hard to think of a time when the headlines weren’t about some hot spot or another in that volatile part of our world. This wouldn’t surprise the Latin Americanists among us; it sometimes seems that the Southern Hemisphere is terra incognita for the media. That’s one reason why Partnership for the Americas: Western Hemisphere Strategy and U.S. Southern Command is so refreshing. This new book from the National Defense University, written by Admiral James G. Stavrides, formerly in charge of the Southern Command, focuses on the nations of Latin America and the Caribbean as if they are more than just “America’s backyard” – a phrase that the author dislikes intensely. He sees this area as “our shared home” – shared with nations that take enormous pride in their histories and cultures and sometimes view their large North American co-tenant with some misgivings. Partly this is due to another misconception: “all the countries down there are pretty much the same.” Partnership for the Americas is adamant that the diverse languages and cultures in the hemisphere all deserve greater study and respect. In this post-Cold war era, concerns about subversion have been replaced by what the book sees as the real issues – gangs, drugs, and crime. After citing some appalling statistics about the international drug trade as it affects the Southern hemisphere, it points to developments in trafficking that require more than a local or even regional response. Take, for instance, the SPSS, or self-propelled semi-submersible (left). 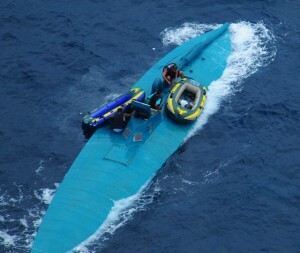 These drug-transporting vessels, about 60 to 80 feet long, transport tons of cocaine, are almost invisible from any distance, and designed to be scuttled at their destination or if intercepted by any military or police vessels. It’s easy to see how the Navy might be helpful here! Partnership for the Americas also focuses on the need to be aware of human rights issues, the role of Southern Command personnel in health care and humanitarian relief efforts, and innovation in the way the military interacts with other nations to accomplish mutually desirable aims. It’s a thoughtful book that policymakers, members of the military, and anyone interested in this part of the world could benefit from reading. You can browse through it here, get a copy here, or locate it in a library. This entry was posted on Wednesday, April 27th, 2011 at 10:17 am and is filed under National Defense University. You can follow any responses to this entry through the RSS 2.0 feed. You can leave a response, or trackback from your own site. Everything you wrote in this blog is clear.Nice to read your contents.Wish to gain more information. EXACTLY WITH THIS ASPECT!! !AND ADMIRE THE SPIRIT OF A BOOK LIKE THIS!AS RESULT I ADMIRE A PERSON LIKE ADMIRAL GEORGE STAURIDIS.HE IS AN OPEN-MINDED OFFICER , AND I LIKE EVERY OPEN-MINDED POLICY ABOUT EVERY PROBLEM!!! CAN SEE THE INTERACTS BETWEEN ALL THEM!!! Hello my dear friends, if is posible search for a book that summit all about the war antisubversion in latinamerica, leftist and others or antiterrorism war. If there is anywhere we need to be making amends with and assisting in development or redevelopment I would think its South America. With the most to gain and the least to lose each country has its own baggage that it needs to address before sitting down for a fairly equitable plan.